Paintless dent repair, or PDR, is a method used to remove minor dents on a motor vehicle’s body. Many types of damage can be repaired with PDR, but it only works if the paint surface is not damaged. If your car is damaged by hail or has minor creases, body lines damages, dents and door dings, PDR will perfect it. Paintless dent repair Alamo gives you the quickest way to renew the look of your vehicle. It can also be used in the preparation of damaged panels instead of using body filler during repainting. It works perfectly and it’s sometimes referred as “push for paint” or “push to paint”. 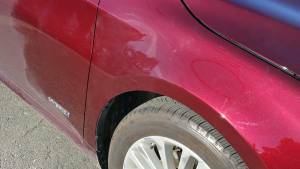 Does Paintless Dent Repair work? Paintless dent repair works and is an environmentally friendly technique to clear dents. PDR techniques use body picks and metal rods to repair dents on your vehicle’s body panel. It has to be done by a PDR pro to get the best results. The paintless dent repair process includes massaging and tapping down to give your car an even look and only a qualified technician knows how much pressure is enough. Pushing hard creates raised spots causing cracking or splitting of the clear coat. Technicians can use heat to prevent chipping or cracking, but it does not help much on a repainted surface. PDR works well and restores the look it had when you got it from the manufacturer. Paintless dent repair saves you up to 70% of the money you would spend repairing dents caused by a hailstorm. The paintless dent repair in Alamo CA 94507 is an extremely affordable method because the process doesn’t require any painting, which is quite costly for damage repairs caused by hail. Paintless dent repair utilizes unique tools that enable technicians to get rid of dents by massaging them away professionally without using any paint. Paintless dent repair has many significant aspects such as saving you time and with not dealing with insurance companies. Since the cost is not as much, the car owner can cover the expenses without involving an insurance company. However, if your car is severely damaged, the auto body shop you choose will let you know if your insurance plan will cover the repair. Insurance companies appreciates that PDR is affordable and may waive deductibles or give you discounts. PDR is less costly and will save you money compared to other auto-body dent repairs. With the help of an auto shop, your vehicle is repaired without sanding, painting or body fillers. You save a lot with door zing damages; though they are tiny and hardly noticeable, removing them will give every car a perfect look. 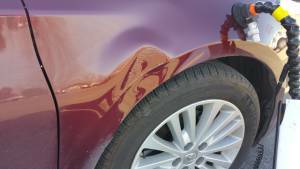 With paintless dent repair in Alamo CA 94507, the damage is reversible; at an auto body shop technicians remove the dented part and it will only take a short time to complete the whole process. Most car owners are worried about dents and especially those caused by a hail storm. They think the dents must be repaired using the traditional methods used in most auto body shops. Paintless dent removal does not include painting. So not just money, it also saves you time. The cost of dent repair on a rental car is reduced and saves you between 50% and 75%. So when dealing with a rental car company, you can quickly pay for the costs as a customer and avoid confrontations. After all, it’s your responsibility. Nothing makes your dent repair easier than mobile service. Paintless dent repair in Alamo CA 94507 services can be offered at your home or you can be in your office working while the skilled technician works on your car in the parking lot. It’s great because you don’t have to waste time taking the drive to the auto shop. Will the dent come back after it is removed? Paintless dent repair Alamo is effective in eliminating door dings, dents, minor creases and large dents. It works as long as the car’s paint surface is still intact. Paintless dent repairs give permanent results. The dent does not come back after it’s removed unless your car gets a new dent. Why use an experienced PDR tech over a newbie? Unlike a newbie, a seasoned PDR knows how to handle the paintless dent repair, which guarantees you excellent results. When I look for mobile paintless dent repair near me, I get someone with experience for excellent and quality service. Paintless dent repair cost is affordable and there’s no need to risk DIY with your highly valuable car. If it backfires, you will have to go an auto shop or get a mobile technician. The whole process is delicate and impossible if you have no experience in handling auto repairs. It takes the hand of an expert to massage and clear the dents, so you should never try DIY PDR. Paintless dent repair requires a pro to keep your car in good condition. Using the dent removal, you can increase the value of your car. However, when done poorly, it can damage your vehicle and make your car lose its shiny and brilliant look. A dent pro that has experience and time in the trade is worth hiring. How much does it cost for Paintless Dent Repair? The cost of debt removal depends on your location. Typically, it’s affordable and only takes a short time. The cost for dent removal is between $50 and $450 an inch in different states in the US. Why is Paintless Dent Repair environmentally friendly? Paintless dent repair helps you maintain your car for a long time. You do not have to dispose of it in a junkyard where it can rust and affect the environment. This method of dent repair does not use paint and reduces the amount of toxins released into the air. Why choose Dent Erasers LLC for your Mobile Dent Repair needs? When looking for paintless dent repair in Alamo CA 94507, Dent Erasers should be your number one choice. They are dent pros with more than 20 years of experience, with a flawless reputation and a 5-star rating for the past decade. They are fast, affordable and have all dent repair services under one roof.